It is biobased, so you would think it would be rather appealing in this era of "get-us-off-of-Big-Oil". It is an oil found in the sap of various species of the genus Toxicodendron, plants which grow in the temperate zones all across the northern hemisphere, so it can be grown widely. The plants are actually considered undesirable weeds plants and are not cultivated, which is a further attraction of this plant as it will not need arable land. But if you looked closely at the Latin genus I just listed, you will notice that it is made up of two words - toxic as in "poison" and dendron as in "tree". Put the together and you have "poison tree", as in poison ivy, poison oak and poison sumac, three popular (?) species of the genus. Having been in the Boy Scouts for 7 years, I've already "worked" with urushiols and found that they don't like working with me. 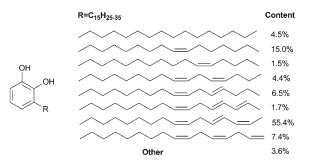 Urushiols are actually a bunch of substituted catechol molecules as this figure shows [*]. The molecule has two parts - the catechol head (the dihydoxybenzene)and the mostly unsaturated hydrocarbon tails. As far as the contact dematitis and associated itchiness, it seems to me that the catechol is the business end, as catechol itself is noted for causing contact dermatitis. (I've never done a side-by-side test of urushiol and catechol to see if the effect is similar. I would, but my calendar is booked out for the next 23 years or so...). But in terms of forming a thermoset polymer, the double bonds react with themselves and oxygen to polymerize, much like what occurs with drying oils. Urushiols have actually been used in Asia for hundreds of years to create the beautiful lacquers that are so emblematic of their furniture and artworks. The sap is diluted down with solvents, a thin layer is applied and allowed to dry/cure. The process is repeated hundreds of times building up to incredibly beautiful finish. [*] Source The source can be freely accessed (after a simple registration) for the remainder of 2012.
happily, the catechol is a no-go for small-molecule drugs (rapid clearance via oxidation to the isoquinone or conjugation to the sulfate or glucuronide) and the hydrocarbon chain flunks on rotatable bonds. While you are correct that dendron is Greek, scientific names are still called "Latin names" and the are of Latin grammatical form, regardless of their origin. It's a thin line, but it does exist.